Cool Refrigerator Magnets Out of Hot Glue! Hi Friends! I have a fun and easy craft for you today! Did you know you can make a whole bunch of stuff out of hot glue?? I didn’t either, so I thought I’d share with you how to make cool refrigerator magnets just using hot glue and a silicone mold. I was inspired by this cool new book I received called Hot Glue Hacks and Crafts, that shows you how to make 50 fun crafts out of hot glue. I was in awe of all the amazing projects they came up with. I never would have thought to make crafts just out of hot glue. You can grab a copy on Amazon below. I never thought about using silicone molds I had but after I read the book, I grabbed one out and made these cool refrigerator magnets. Let’s get started! I’ve had this jack-o-lantern silicone mold for years and rarely use it anymore, so I thought it was the perfect mold to try with. I heated up my glue gun with a long glue stick in it. I actually only had one glue stick on hand the first time I tried this craft, so I had to wait until I got more to complete it. The glue goes fast! I probably used 3 sticks to make 4 jack-o-lanterns. I made a few different jack-o-lantern hot glue decor. To make a glitter DIY magnet, dump some orange glitter into the mold and spread it around evenly. I wanted contrasting eyes and smile so I carefully scooped black glitter into those crevices. Use a stick or end of paint brush to gently push them in all edges of the crevices. Then add your hot glue. Starting at the edges of the mold and working your way in. Make sure to get glue in all the corners. Wait until it’s cool and pop it out. I ended up painting the backside orange to make the colors pop more. I also made one just with hot glue. Just squeeze the hot glue so that it covers the whole bottom of the mold. I started on the edges and worked around to the middle. You want to make sure you don’t have any gaps or holes. Once it’s completely cooled, pop it out. It only takes 30 minutes or so to cool. If there was any lifted up edges on the back side, I just cut them off with scissors. I used acrylic paint to paint a couple of layers of orange on the front side and black on the eyes, nose, and mouth. This is great place for your kiddos to get involved!! Give them a bunch of paint and let them have fun creating their own DIY magnets. Let it dry and then you can add adhesive magnetic buttons to the back to hang on any metal surface. My utensil holder is metal so I added my cool refrigerator magnets to them, along with the side of my fridge and dishwasher. Or you can put adhesive foam squares on the back to make any decor you have more festive! Cute and easy, right? Imagine the possibilities of all the cool refrigerator magnets you could make for every season! There are so many different silicone molds and you could also use these hot glue crafts as tags on gifts, ornaments, or party favors! What would you use them for?? Since this is a super quick craft it is part of Lightning Craft Challenge hosted by Angie at TheCountryChicCottage, Carolina at 30MinuteCrafts, along with co hosts 100Directions.com, Mine for the Making.com and Creative GreenLiving.com! 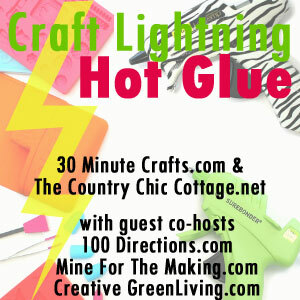 Make sure to hop on over to their blogs to check out all the fun hot glue crafts they made! Remember to go grab a copy of the book to see a bunch more glue gun crafts! If you’d like to save this idea for later, PIN the picture below! These are great! Love the idea of adding glitter to the mold first! Thanks Angie!! I love all your inspiration in your book!